The What: Magewell is now shipping the Eco Capture Dual HDMI M.2, the first of three models unveiled earlier this summer in its new Eco Capture family of high-performance, power-efficient video capture cards for OEM developers. The company also today announced a fourth configuration, designed to provide quad-channel capture density while maintaining the Eco Capture series' ultra-compact form factor. 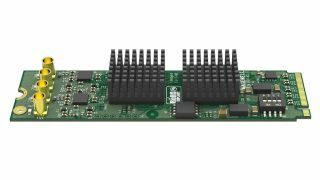 The What Else: The first four Eco Capture models feature a high-speed PCIe 2.0 bus interface with an M.2 connector and measure just 22x80mm (0.87x3.15 inches), matching the M.2 2280 size specification. Power consumption by the Eco Capture cards is 30- to 70-percent lower than Magewell's Pro Capture cards with similar input signal connectivity and channel count. First introduced at InfoComm 2017, the Eco Capture HDMI 4K M.2 captures one channel of 4K video up to 4096x2160 at 30Hz via HDMI, while the dual-channel Eco Capture Dual HDMI M.2 and Eco Capture Dual SDI M.2 capture HD or 2K video up to 1080p60 over HDMI or SDI interfaces, respectively. The newest addition to the product line, the Eco Capture Quad SDI M.2, doubles the latter offering's channel density, capturing four concurrent HD or 2K SDI source signals. "The Eco Capture family enables OEM developers to incorporate Magewell's renowned capture quality and reliability into smaller products with lower power consumption, and customer feedback on the product line has been very positive since its introduction," said James Liu, VP of engineering at Magewell. "We are excited to now be shipping the first Eco Capture model, and we will continue to develop additional new configurations in response to OEM customer needs." The M.2 Eco Capture models are available with drivers for Windows and Linux operating systems. OS-native capture APIs including DirectShow, DirectKS, V4L2, and ALSA are supported, and a comprehensive SDK enables developers to directly access the full feature set of the cards. Stream replication enables each input channel to be delivered to multiple software applications simultaneously with identical capture parameters. FPGA-based video processing provides high-quality up/down/cross-scaling, picture controls, and color space conversion without tasking the host system CPU, while additional processes are performed by software. All four models also support up to eight channels of embedded audio per input. The Bottom Line: Designed for use in small and embedded systems where full-sized PCIe slots are not available, the Eco Capture family complements Magewell's flagship Pro Capture series by offering OEM customers a robust capture solution with low power consumption for space-limited applications.